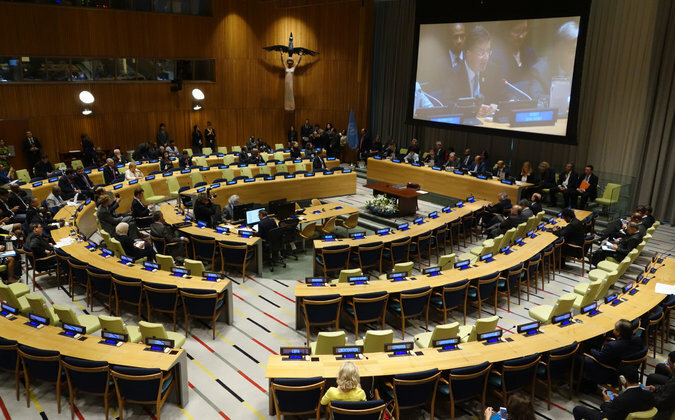 Despite those admonitions, at least 53 member states of the United Nations have signed the treaty since a ceremony to start the ratification process was held at the United Nations General Assembly on Sept. 20. The treaty will go into effect 90 days after 50 members have formally ratified it. As of Friday, three — Guyana, the Vatican and Thailand — had done so. Under the treaty, all nuclear weapons use, threat of use, testing, development, production, possession, transfer and stationing in a different country are prohibited. For nuclear-armed nations that choose to join, the treaty outlines a process for destroying stockpiles and enforcing the countries’ promise to remain free of nuclear weapons. The prize came against the backdrop of the most serious worries about a possible nuclear conflict since the Cold War, punctuated by a bellicose standoff between the United States and North Korea. The signing ceremony at the United Nations in New York last month for the Treaty on the Prohibition of Nuclear Weapons. President Trump has said he would have no choice but to destroy North Korea if the United States or its allies are attacked. Proponents of the treaty have said that they never expected any nuclear-armed country would sign it right away. But they argued that the treaty’s widespread acceptance elsewhere would increase the public pressure and stigma of possessing nuclear weapons. The coercive power of such public shaming, treaty supporters said, eventually would lead the holdouts to change their positions and disarm. Nuclear weapons have defied attempts to contain their proliferation since the United States dropped two atomic bombs on Japan in 1945, ending World War II. The unspeakable destruction wrought by those weapons laid the foundation for the nuclear arms race and the doctrine of deterrence, which holds that mutually assured destruction of nuclear-armed antagonists is the only way to prevent an attack. Proponents of that doctrine contend it has basically kept the peace for more than 70 years. Besides North Korea, Russia and the United States, the other nuclear-armed states are Britain, China, France, India, Pakistan and Israel. ■ Jacques Dubochet, Joachim Frank and Richard Henderson were awarded the Nobel Prize in Chemistry on Wednesday for developing a new way to construct precise three-dimensional images of biological molecules. ■ The English novelist Kazuo Ishiguro, known for his spare, elliptical prose style and his inventive subversion of literary genres, was awarded the Nobel Prize in Literature on Thursday. ■ President Juan Manuel Santos of Colombia was honored for pursuing a deal to end 52 years of conflict with the leftist rebel group known as the Revolutionary Armed Forces of Colombia, the longest-running war in the Americas, just five days after Colombians rejected the agreement in a shocking referendum result. ■ The Nobel Memorial Prize in Economic Science will be announced on Monday in Sweden. Read about last year’s winners, Oliver Hart and Bengt Holmstrom.